TIRED OF YOUR SMALL DOWNTOWN APARTMENT? Need more space? Come visit The Westbourne. February Promotion - - -Now offering One Month Free and No Brokers Fee ! Gorgeous gut renovated pre-war apartments. Kitchens are modern,sleek & open featuring Frigidaire gas ranges, microwaves, dishwashers and refrigerators, all wood cabinetry, granite countertops, Carrara mosaic marble and brick polished backsplashes. Inviting living spaces feature 10'-12' ceilings, oversized windows and Brazilian Cherry hardwood plank flooring throughout. There are sprawling bedrooms with wall-to-wall closets, oversized windows, and modern detailing. Classic style baths have Kohler fixtures accented by marble vanities with porcelain and ceramic tiling. The building features a key fob entry with digital intercom system, laundry room, elevators, newly installed windows and mailboxes. This 3BR/2BA has spacious bedrooms and living room. Unlike most apartments there is plenty of room for a dining table for entertaining friends and family! The Hamilton Heights neighborhood is bustling. 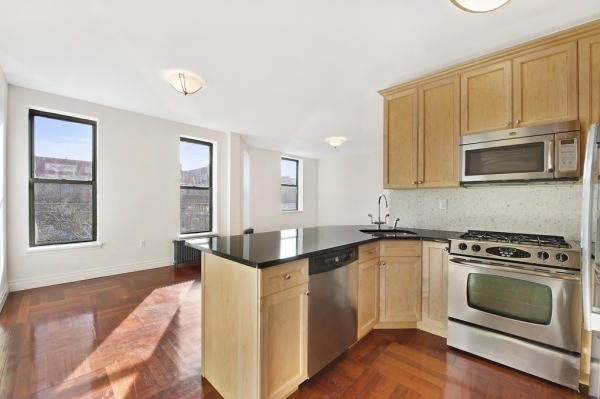 The Westbourne is located on West 137th Street between Riverside Park and Broadway. The 1 Train is right on the corner of Broadway. Easy access to the rest of the city. Riverside Park is absolutely beautiful and it is right outside your door. Columbia’s Manhattanville Project is spurring much growth with new restaurants and shops opening. Email Virginia for more information.